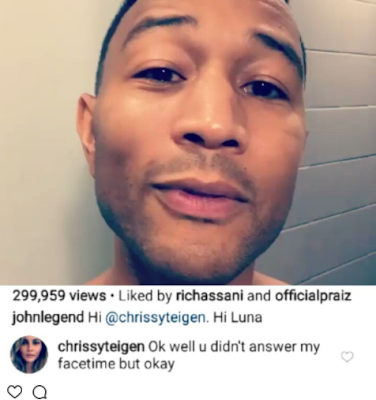 John Legend shared a video of himself singing about coming home to his wife Chrissy Teigen and daughter Luna. He went on to Tag Chrissy in the video but her reply to him was not as romantic as his song to her. Apparently, she had been trying to call him on Facetime and he didn't answer so she let her anger out in the comment section of the video.